Having the chance to have dialog with the great Eric Braeden will be an extreme blessing. The show Tuesday 10/16 at 9pm pst. Nexxlegacy Radio (NexxChapter) will celebrate the legacy that Eric has created, and still creates to this day. You will hear Eric talk about the work it takes to maintain the drive to become the best in your craft, also we touch on information regarding politics, the voting process, also reading between the lines when it comes to real actors, versus reality shows and the networks that carry them. Plenty more conversation, but the spotlight will shine bright on the man that's inspired me, and all you out there. If you are motivated by the hard work and effort that actor's take to embrace their craft, Join us Tuesday Night as Eric Braeden turns the NexxChapter at 9pm pst. Television Icon, Emmy Award and People Choice Award winning actor, Eric Braeden has starred is arguably one of the most popular character in daytime history, Victor Newman for over 32 years on the #1 rated soap THE YOUNG AND THE RESTLESS for 28 consecutive years which airs on CBS from Sony Pictures Television and which is syndicated in 30 foreign countries on five continents. But Eric is much more than one of the most recognizable faces in daytime television. He's a successful feature film actor and producer and he's a man of carefully measured opinions on important national and international issues. In 1958, he won the German Youth Team Championship in Discus, Javelin and Shot put. Braeden, a former pro-soccer player for the Israel team The Maccebees which he won the 1972-73 US Championship. "The Young And The Restless" can be seen in over 30 foreign countries over 5 continents including Australia, Belgium, Canada, France, Greece, Israel, India, Italy, Middle East, New Zealand, Romania, Slovenia, South Africa, South America, Switzerland and Turkey. "The Young And The Restless" has a daily international viewing audience of 120,00,000. Braeden was the recipient of a Star on The Hollywood Walk Of Fame on July 20, 2007 and became the first actor from Germany to receive a Star since Marlene Dietrich in 1960. .
Braeden has the highest TVQ in daytime television according to (source: AC Nielsen) and is one of the most recognized actors in the world. Braeden has starred in over 120 primetime televisions series and feature films. Braeden starred as Charles Forbin in the sci-fi classic "Colossus: The Forbin Project" directed by Joseph Sargent. Braeden portrayed John Jacob Astor in one of the most successful features in film history "The Titanic" directed by James Cameron. Braeden starred in the 1960's classic primetime series "The Rat Patrol" as Captain Hans Dietrich. In 1989, Braeden was chosen as the only actor on the newly formed German American Cultural Advisory Board. The illustrious group has included Dr. Henry Kissinger, Katherine Graham, Alexander Haig, Steffi Graff and Paul Volcher. In the mid 1990's, Eric was also in Israel at the request of the Israel Government to tour the country. Eric is very Pro-Israel and Pro-Jewish. In 1995, Braeden received the highest honor from Italian television in Italian Television in Italy from Prime Minister Berlusconi. In 1996, he was an honored guest at The 38th Annual Monte Carlo Television Festival. 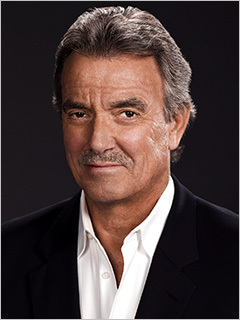 In 1998, he received the People's Choice Award as Favorite Actor In A Daytime Drama Series for his role as Victor Newman on The Young And The Restless.